Fucanglong Online Slot is a 5 reel, 1024 payline Chinese mythology slot powered by Real Time Gaming. 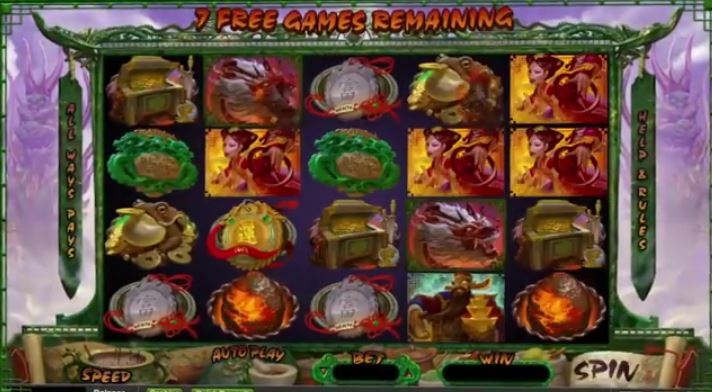 Scattered Dragon Mountains trigger a free game feature, with frequent retriggers adding extra games and increasing the prize multiplier up to x8. During the The Fucanglong Feature extra free games are played until the total feature win reaches the Pearl value, but on each extra game the Pearl value increases! During the Feature the Wild Dragons expand to cover their reel!